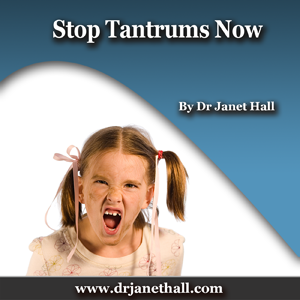 HOW TO STOP TANTRUMS NOW! The principles inherent in this recording do apply across all ages, from the terrible two year olds to “testy” teenagers and even to road rage adults. So why do young children tantrum so much? It’s because it’s part of their knee-jerk reaction to the frustration of not getting what they want, when they want and because it generally makes them feel better to release and work off their frustrations by having a tantrum. A young child doesn’t have the ability to rationalise and reason like a mature young person or adult, so they go into a tantrum as stress release. (When you think about it, this stress release mechanism probably starts with the birth cry). Yes, but what do toddlers NEED you might ask! They need to be kept safe from themselves and from their environment, whilst they have freedom to explore the world. The best form of protection for them comes from having rules and guidelines which parents impose on them, but of course- the toddlers fight these rules all the way. Here’s some hot questions that parents typically ask when I do a workshop on “How To Cope With Fighting Families”. When you’re tired as a parent, how do you control your own anger, especially when you feel that you’re nearly being pushed over the edge! Expecting a three year old to say sorry! That’s a bit of a unrealistic expectation wouldn’t you agree? And here’s one about Time Out. “How do you get a three year old who has been crying and whining in his bedroom for 3 hours to STOP and tell you what’s wrong? The Good Kid Game empowers parents with safety-net procedures for tantrums which produce least fuss and least upset. Just $15.95 to change your life!